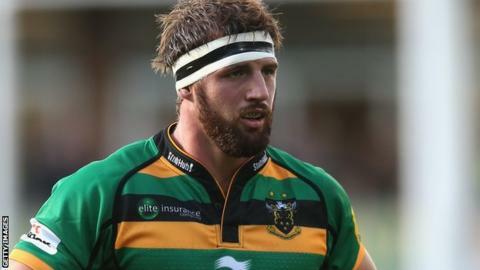 Northampton Saints flanker Tom Wood says they have learned a "cruel lesson" in missing out on a losing bonus point in the 20-11 defeat by Racing Metro. Saints trailed by two points in their European Rugby Champions Cup opener but gifted the French side a try after an ambitious attack from deep went awry. "You can say it's ambitious to get the win but sometimes you've got to be smart," he told BBC Radio Northampton. "We were good but not outstanding. It's a pretty cruel lesson to learn." "We've given ourselves a mountain to climb. We'll have to do it the hard way now but we're prepared to do that." With Saints' next opponents Ospreys securing a bonus-point win over Treviso, they already face a challenging campaign to qualify from Pool Five. "To some extent, it's a different sport in this competition and playing away in France," said Wood. "Our defence wasn't as intense as it could be and our breakdown ferocity wasn't quite there. "It feels like the end of the world right now, as we've put a lot of effort in and come away with nothing.